The 3D Pool Table is the 1st pool table in the world to have both horizontal and vertical game play. 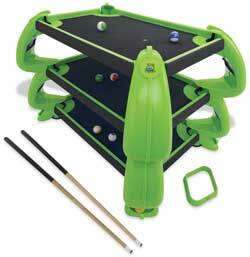 The game is similar to pool in that a player wins the game by hitting his or her balls into the pockets. The difference is that there are 3 levels, 2 cue balls, and 8 game balls (4 game balls each). The goal is to use your cue ball to send your game balls down to the bottom pockets first. The exciting part of the multi-level table is that balls can be hit up the scoops. Strategy becomes a major part of this game and with a little skill, game balls will be going up or down to different levels. 3D Pool is fun for the entire family and is built to last.